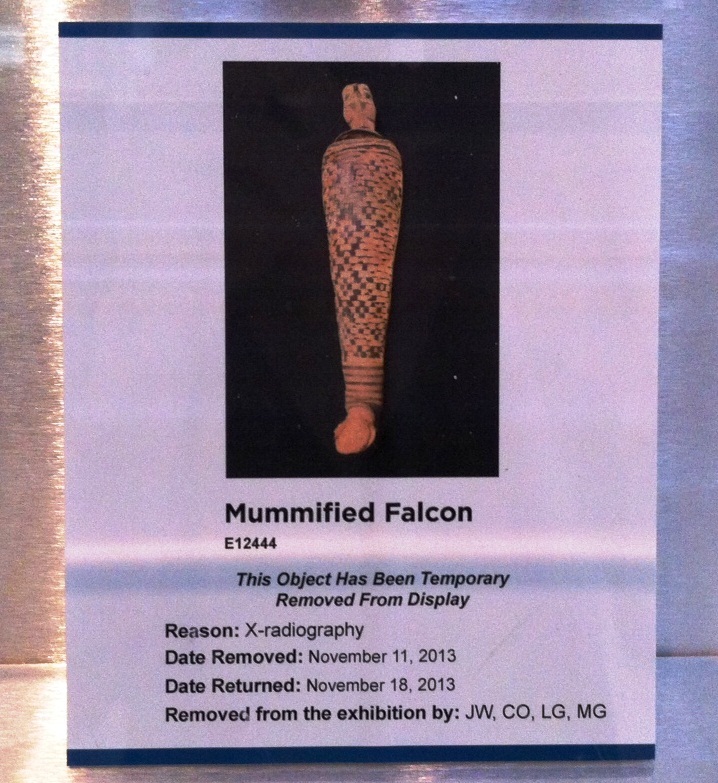 I think it’s about time we introduce you to a special occupant of the Artifact Lab. 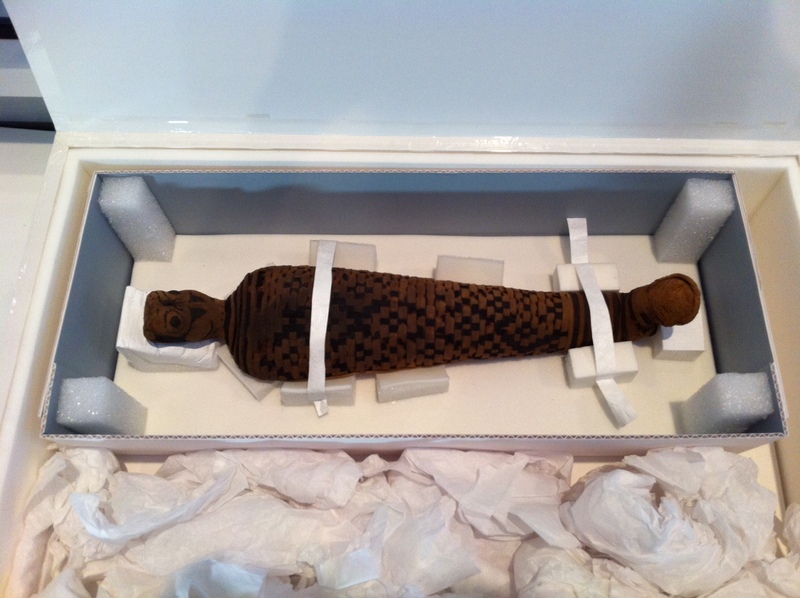 This baby boy mummy, who dates to the Third Intermediate Period (1075-656 BCE), has been in our collection since 1898, when he was donated to the museum by Dr. Henry Shurtleff. In the University’s 1898-1899 Annual Report of the Provost to the Board of Trustees, it states that Dr. Shurtleff presented the infant mummy to the museum on Christmas Day, as an “admirably preserved specimen and an interesting pathological subject”. 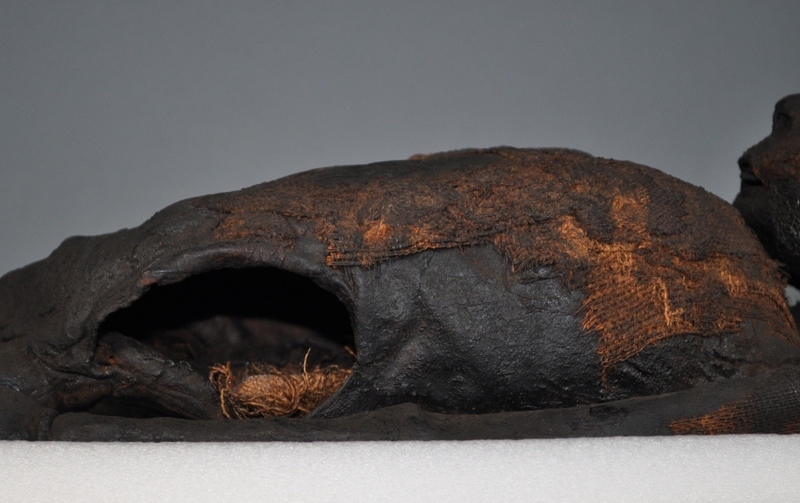 It seems that this mummy came into the collection unwrapped – he only has small amounts of textile preserved on his body (and there is currently no evidence that the cloth partially covering his body in the image above is related to his remains, but this remains to be determined). 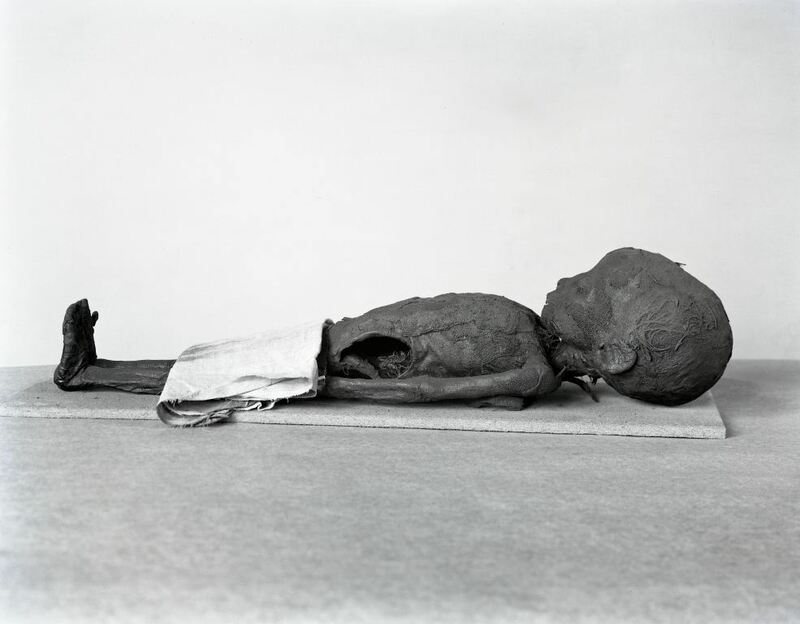 While the fact that he is unwrapped is unfortunate, it allows us to see how well preserved his remains are and evidence of how his body was mummified, including evisceration through an incision on the left side of his torso. The open incision on the left side of his body reveals a mostly empty body cavity, containing small bundles of linen. A CT scan in 2009 further reveals how this boy’s body was mummified, and also reveals damage not visible from the exterior. For example, it is clear that his brain was removed, likely through the nose (but due to the small side of his nasal bones it is not possible to see evidence of this). The scan also reveals a large hole in the left lower side of his skull, and the piece of missing bone resting inside his skull. Two CT still images show the child mummy’s skull with a piece of bone resting inside the cranium (left) and the hole created as a result of this loss (right). Oddly, this damage to his skull is not visible from the exterior, but it may be the result of trauma. His cause of death has still not been determined, but this damage may provide a clue. The information from the CT scan tells us that this child was less than 2 years of age when he died, based on the fact that his fontanelle (the soft spot) is still open, and also on the development of his teeth. The open fontanelle on the top of the baby’s head is indicated in these 2 images with blue arrows. The excellent preservation of his body is not the only remarkable thing about this baby boy. While examining his remains, we noticed traces of a green substance in areas, including on his face and fingers. Left: A detail of the green substance under the boy’s right eye. Right: An overall view of the boy’s face, highlighting the locations of the green substance in a brighter green color. This substance resembles copper corrosion, and it may either be corrosion from copper that was once in contact with his body (during burial), or may be traces of a green copper-based pigment. How do we know this green substance is copper-based? We tested it with our portable x-ray fluorescence analyzer, which showed high peaks for copper in these areas. While we’re still working to interpret some of this information, I can tell you one thing for certain: this baby boy mummy sure is special. And if you visit the lab, you just might catch a glimpse of him.